Let’s pretend we’re machine code programmers! Another living nightmare. We’d have to stick about a million clauses into our client-side code—which is error-prone in the first place—and then it would require a gargantuan cleanup effort if any attribute ever changed or a new one was added. So what are we to do? Then another coworker saved me from myself. “How about instead of reinventing filesystem permissions, we just use bitwise operators?” he said. Ah yes. Those. I had some vague idea what they were—I’d used the ~ a few times over the years—but I’d never fully understood them. Fortunately, this coworker had used them on a previous project and was able to enlighten us. Bitwise operators do indeed operate on the same general concept as filesystem permissions, but much more elegantly than how I imagined. Instead of operating on integers, manually adding and subtracting, bitwise operators work on the bits that represent each integer, letting you compare and manipulate them directly. So you can use them to manipulate a 4-bit number (or 3-bit, or 12-bit, whatever) according to its zeroes and ones, with each bit representing one of your true/false attributes. I’ll explain. // ...so this means fooBar, in decimal form, now equals 4. Rad! You might be able to see where this is going. Given the full gamut of bitwise operators, we can now add, subtract and compare in binary. In my specific example above, we can store all four of our possible attributes in a single 4-bit number, between 0000 - 1111, with each bit representing either true (1) or false (0). So you can imagine that using this schema, the binary number 1111 would mean all attributes are true, the rest are false; 1000 would mean only the fourth attribute is true, etc. (keep in mind binary counts will go right-to-left; the “first” attribute would be 1, or 0001; the “fourth” would be 1000). 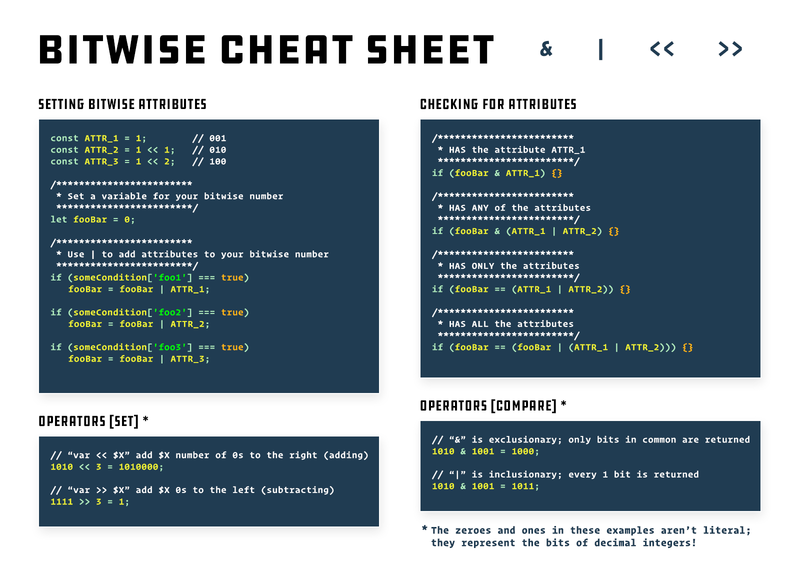 The two most important bitwise comparison operators are “&” and “|”. Their resemblance to “&&” and “||” is intentional, but perhaps misleading. “&” will return a binary representation of the intersection of the two numbers you’re comparing, “|” returns the union. So 1010 & 1001 will return 1000, because the leftmost 1 is the only bit in common between the two; 1010 | 1001 will return 1011, because those are all the bits in common. I’m being longwinded. Let’s just get to the damn example. // form, etc. You might not know it beforehand. // and using if statements to add attributes one at a time. * fourth attributes are true. // an intersection between them. // Test whether your bit number contains ALL of the given attributes. And that’s the quick summary. A functional example of using bitwise operators to store and compare multiple true/false attributes efficiently. It’s fairly easy to read and understand, simple to update and maintain, and if you need to edit one clause or even add another attribute, it’s not exponentially difficult. And the best part is you get to deal with zeroes and ones, so if you drink enough coffee and close your eyes, for a few fleeting moments you can almost pretend you’re 1950s machine-language coder.